Chicago Teachers Union President Karen Lewis isn&apos;t declaring a one-day strike, but "I&apos;m not not saying it, either." CHICAGO — Some Chicago Public Schools teachers who aren’t sold on their union’s decision to call a one-day strike will face consequences if they cross the picket line on April 1. A South Side high school teacher who asked not to be identified told me that she learned her plan to show up to school on the so-called “Day of Action” would get her kicked out of the union. Last week, nearly 80 percent of Chicago Teachers Union delegates voted to approved the “Day of Action” that aims to put pressure on state lawmakers to break a state budget stalemate that has delayed funding for city school kids and could lead to massive CPS cuts, layoffs and school closings. Another teacher — a South Side grade school instructor who also spoke on the condition of anonymity because she feared retribution — said she is “morally and ethically” against the walkout and her loyalty to her students trumps her loyalty to the CTU. "How do I get out of being part of this debacle?" is a question being asked in teacher lounges at schools across the city," the grade school teacher said. 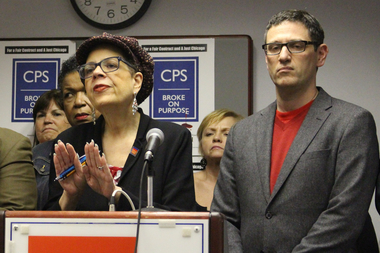 CTU leaders have publicly acknowledged that a small percentage of members disagree with the school walkout strategy but the union insists that once delegates approved the measure, the rank-and-file must fall in line to show solidarity. CTU financial secretary Kristine Mayle said teachers considering showing up to work on April 1 have been informed of provisions in the union bylaws that relate to “strike breakers” that date back to at least 1971. “We put out information in response to questions but we are not trying to threaten members. But if someone crosses the picket line they undermine the union. We have to do this together or it doesn’t work,” Mayle said. A teacher excommunicated by CTU would still have to pay union fees because they receive the benefits of contract negotiations, but they lose other benefits including union-provided liability insurance, according to a memo sent to a member who crossed the picket line during the 2012 teachers strike obtained by DNAinfo Chicago. The high school teacher who asked not to be identified said solidarity isn’t a good enough reason to walk out on her students for even one day in the middle of the school year. “It sends the wrong message to the kids. We’re there to teach and set a good example. This sets a horrible example. I think we are being used as pawns to get legislation passed,” she said. After the 2012 teachers strike a “handful” of members were booted from the union for crossing the picket line. CTU members accused of being strikebreakers can regain good standing in the union but, according to union rules, those who cross the picket line are fined the amount of salary they receive from CPS during the strike. The South Side high school teacher said she’s planning on showing up to work for her students' sake and she’s not interested in paying a fine to rejoin the union. “The only thing I’ve gotten out of the union is a pocket calendar,” she said.